Mainstream galleries didn't take Canadian native artists seriously even a decade after Norval Morrisseau's huge Toronto success. The art establishment still considered work by First Nations' artists as simple iconography. The artists themselves eventually tried to develop their own opportunities. Morrisseau had been mentoring brothers-in-law Joshim Kakegamic and Goyce in Sandy Lake but they had few legitimate markets for their work and some unscrupulous dealers even wanted them to sign over reproduction rights along with the original artwork. Josh and Goyce had the gumption to open their own screen printing company, the Triple-K-Cooperative in Red Lake even though they had to learn the intricacies of distribution, commission structures, gallery versus artist responsibilities, copyright and the like...all from a remote mining community 100 miles north of Kenora. But they succeeded and provided opportunities for themselves and other Canadian native artists to be known beyond the Canadian bush country. It wasn't until 1972 that the log jam broke! That year Daphne Odjig, Jackson Beardy and Alex Janvier took part in a group show at the Winnipeg Art Gallery. They called it Treaty Numbers 23, 287, 1171 - referencing the particular treaties that controlled life on the home reserves of each artist. Winnipegers took note. Other shows followed in other parts of the country for the trio, but even more importantly, the art world had finally opened the door for Canadian native artists to participate in this country's art mosaic. 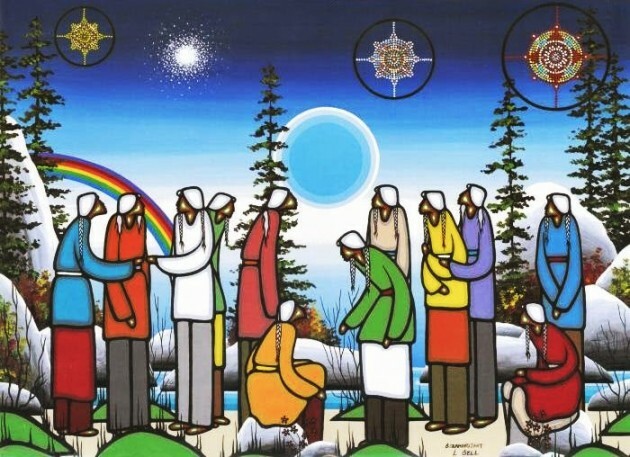 The following year Daphne Odjig, Jackson Beardy, Alex Janvier, Norval Morrisseau, Carl Ray, Eddy Cobiness and Joe Sanchez formed the Professional National Indian Artists Incorporation in the hope of furthering careers of a new generation of First Nations' artists. It was Gary Scherbain, reporting for the Winnipeg Free Press, who coined the term ... the Indian Group of Seven ... to describe the group. If you know of other young people who participated please let me know. I'm aware that Martin died very young, but I'd like also to be able to add some information to Randy Trudeaus' bio. Here's some biographies of other Canadian native artists who ultimately have made art a career because of the long term influence of the Indian Group of Seven.